Arizona Supreme Court decision: Redistricting ruling undermines Bush v. Gore. This Supreme Court decision is a dig at Bush v. Gore. 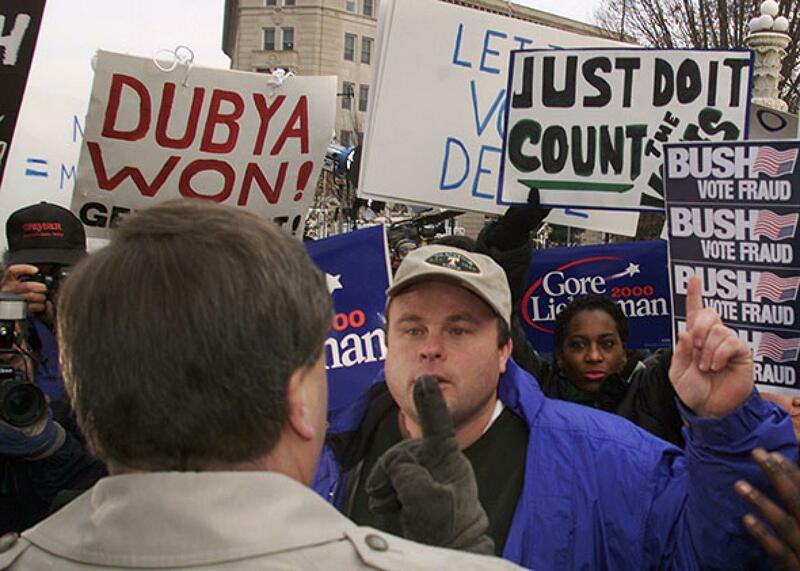 George W. Bush and Al Gore supporters argue with each other in front of the U.S. Supreme Court building on Dec. 11, 2000. Voters have passed measures affecting not just redistricting but also primaries and lots of other election law rules. Indeed, Ginsburg noted that if the dissenters had prevailed, then even state constitutions guaranteeing voting rights could be subject to challenge because constitutional amendments are passed by voters and are not simply enacted by a state legislature. Had Roberts prevailed, it would have been terrible news for those who believe that sometimes the best election reforms happen when the people can choose democratic rules for themselves. Roberts was not even entirely consistent as a textualist. He was willing to allow state governors and voters to have a say in the process, as long as the legislature had some input. Maybe he took that view because of earlier precedents. Even so, his literalism was not all that literal. The Arizona dispute over the term legislature harkened back to one of the most important election disputes in American history, the 2000 fight in Bush v. Gore over whether to conduct a recount of Florida ballots. The Supreme Court held that the set of recounts and other election changes ordered by the Florida Supreme Court violated George W. Bush’s Equal Protection rights. The court, on a 5–4 vote, stopped the counting and Bush was declared the presidential winner. Justices Kennedy and Sandra Day O’Connor are widely thought to be the authors of the unsigned Bush v. Gore majority opinion. Its Equal Protection rationale was an expansion of Equal Protection law that remains controversial to this day. Conservatives who defend the court’s decision to end the counting usually point not to the unsigned majority opinion, which expanded Equal Protection rights but to a concurrence written by Chief Justice William Rehnquist and joined by Justices Antonin Scalia and Clarence Thomas. That concurrence argued that when the Florida Supreme Court set up rules for the recount, it usurped the power given in the Constitution’s Article II to the state “Legislature” to set the rules for conducting presidential elections, a provision parallel to the Elections Clause argument at issue in this week’s Arizona case. No one in the Arizona case cited Bush v. Gore (and it has never been cited in a majority opinion since it was decided in 2000), but the decision is an implicit dig at the Rehnquist concurrence. The idea that we would read legislature in the Constitution to prevent a state supreme court from even interpreting the meaning and scope of legislative election statutes was ludicrous in 2000, just as it is today. Mindless literalist interpretations in the service of conservative causes are nothing new, but they can be quite pernicious. In this week’s Arizona decision, as in last week’s King case, sometimes there is a (bare) majority on the Supreme Court willing to think about the real-world implications of its decisions as it interprets the Constitution and major federal statutes. Fortunately for voters, Kennedy made the crucial decision to join the court’s liberals in rejecting textualism and allowing for just a little less partisanship in our election procedures.